Those who are using Voice Changer Software for fun or for work should not ever miss the very excellent Add-on Store from Audio4fun that provides tons of voice effects and voice packs. Audio4fun Add-on Store was built for all users of Audio4fun's products. Stuffs from it are mainly created to support the Voice Changer Software product line, which is known as the major product of the company (Avsoft Corp.). While the Voice Changer Software Diamond was recently released with major updates in 9.5.21 version, the Add-on store was also updated with stuffs to support the new version. 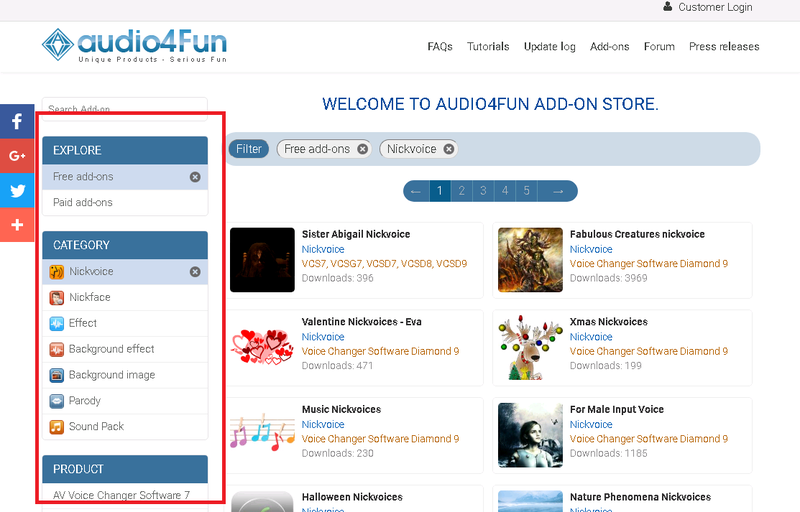 Unlike other voice changing software's authors on the market, the Add-on Store is simply a value added service for all customers of the Voice Changer Software line, especially the Diamond Edition. 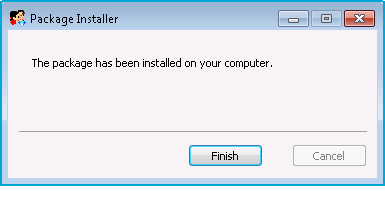 While most of the add-ons could be downloaded for free, to use the add-on, full version of Voice Changer Software is required. Tip: full license of the Voice Changer Software Diamond normally priced at $99.95, but you can always take advantage of the available coupons to purchase it with a cheaper price of 20%-40% discount. The add-on store is already categorized into stuffs name, product name and products version so that users could easily navigate for their favorite stuffs. However, beware that the product name and version of the stuffs must match the product name and version of the voice changer software product you are having. 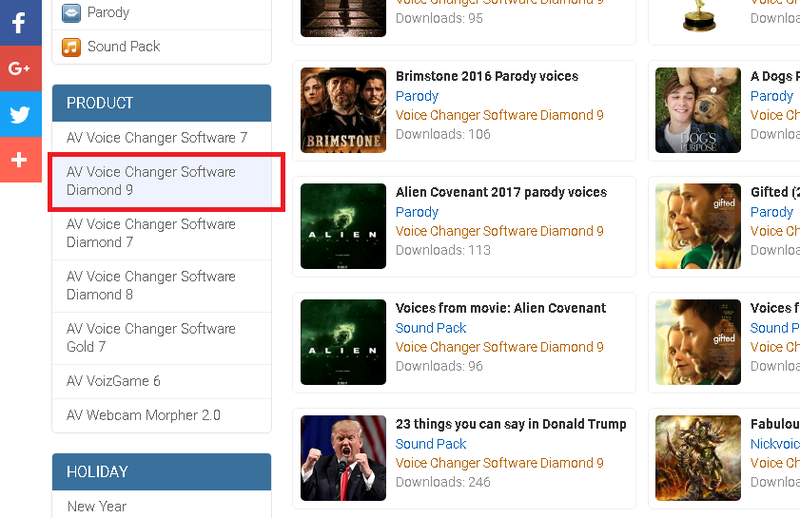 This means; if you are have a Voice Changer Software Diamond 9.5 installed, you should first select the AV Voice Changer Software Diamond under the Product menu. Then, from the Category menu, select any stuff name you would want to browse for. The very basic definition in Voice Changer Software Diamond. It could be consider as a mixture that contains all the settings from Voice Changer Software for outputting a certain voice. The nickvoice pack from the add-on store is almost always a zipped pack with a *.NVC file. After downloaded the pack, it is recommended that you should unzip the file(s) into "%AppData%\Avnex\VCS8\save\" so that you can load it directly from the program's Custom nickvoice menu. Otherwise, you can place the unzipped file(s) anywhere you want and locate it when you need to load it. 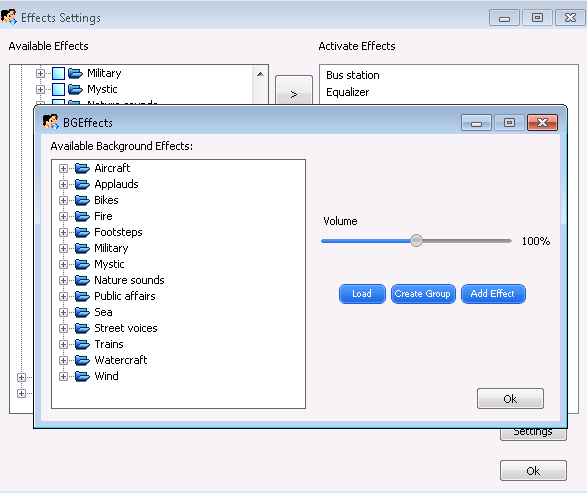 This is a very unique feature which is available in only Voice Changer Software Diamond and Gold editions. 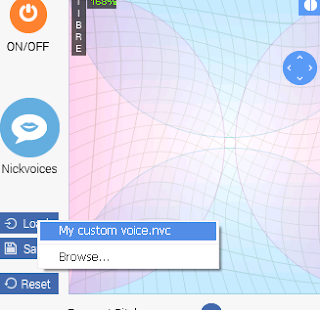 This feature comes with algorithm for quickly modified your voice into any other people voice. We do not talk about the quality of this feature yet, because we all know that imitating any voice exactly the same is a very hard work to do. If one day we can do it by using a software, it would be chaos, I think :D.
So, the Voice Changer Software does dare to provide us such a feature to try. 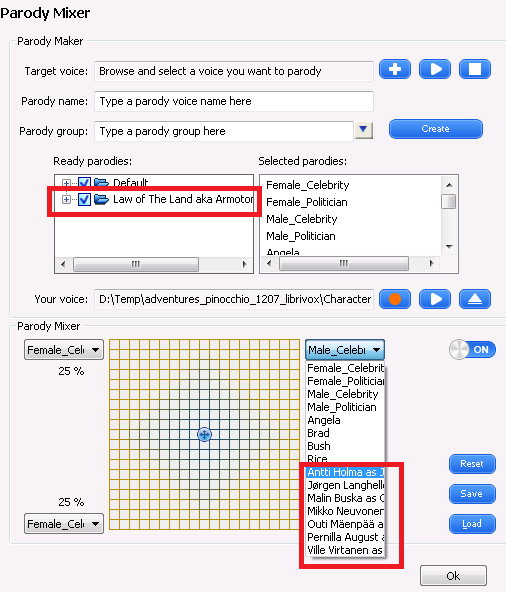 There is still many more for us to discuss about details of this Parody Maker and Parody Mixer in Voice Changer Software Diamond. However, in order to keep this post short, we leave those further details to this post which is credited to its own publisher - Audio4fun. These are also zipped packs with normalized audio files. Those kinds of audio files often be used in such special task like imitating a celebrity voice, Create amazing audiobook from free online source, etc. These are zipped packs with audio files collected and submitted by Audio4fun's users from around the world. After unzipping, these audio files are good to load and use directly in the Background Effect module. As we understand, these kinds of stuffs has not been updated for a long time. However, users of Webcam Morpher may want to browse this section for available stuffs.